This unique round recycled plastic picnic table seats six people comfortably. The round seat benches contour to the table allowing for easy walk-in/walk-out. The table features a generous 45-1/4" diameter top and its smooth surface makes clean-up a snap. 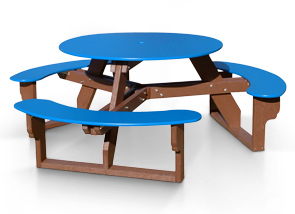 A universal access round recycled plastic picnic table is also available. Assembly required. Available in multiple recycled plastic top/seat and frame color options as shown.